The Homer B. Smith Teacher of Excellence Award has been presented to the “top teacher in Medina County” since 1984. In 1992, the award was named in honor of retired superintendent, Homer B. Smith. 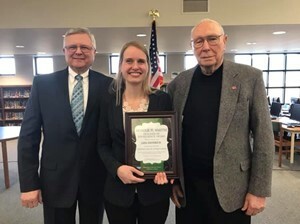 Lisa Heinrich, Cloverleaf Elementary Music Teacher, is the 2019 recipient of the Homer B. Smith Teacher of Excellence Award. Lisa’s passion for music, her enthusiasm and research in the field, and her unyielding commitment to her students makes her an elite educator deserving of this prestigious honor.